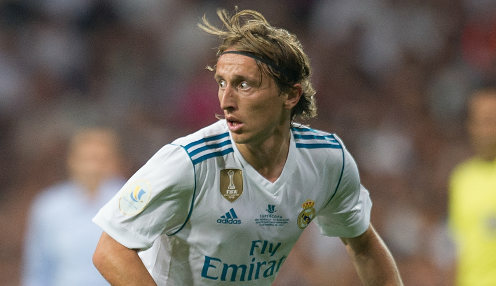 Zinedine Zidane is waiting to see if Luka Modric and Toni Kroos will be fit enough for Real Madrid's Champions League last-16 second leg tie at Paris Saint-Germain. The midfield duo both missed Saturday's 3-1 La Liga derby win against ten-man Getafe at the Santiago Bernabeu, but Zidane has refused to rule them out of Tuesday's trip to Paris where Los Blancos hold a 3-1 first leg lead. The Frenchman said: "They still haven't trained with us, we'll have to see if they do tomorrow. "I will never rue having players absent. They are important players but we have to look to Tuesday's game. If they can't be with us, then someone else will play. We have two days to see how Luka and Toni will be." Zidane was delighted to get back to winning ways on Saturday with Gareth Bale on target, while Cristiano Ronaldo took his tally to 300 La Liga goals in 286 appearances courtesy of a brace. If they can't be with us, then someone else will play. We have two days to see how Luka and Toni will be. The Portugal international was seen holding an ice pack on his calf after being substituted, but Zidane expects him to be fit, while Marcelo also made his return from injury in the second half. Zidane added: "Before a second-leg game like Tuesday it was very important to have three days in a good mood. When you lose it's tough. It was very important to win. We played a very serious game." Real Madrid are priced at 3/1 to win the second leg in 90 minutes and 1/3 to qualify for the quarter-finals, while PSG are 14/1 to win the game 2-0 which would see them progress on the away goals rule and they are available at 5/2 to qualify.